Assassination is a serious business, but the Hitman series likes to play it for laughs, taking the edge off a macabre theme. How else do you explain murder by (dead, stuffed) shark, among many other absurd options? This sequel takes up more or less where the reboot began in 2016, following Agent 47 on his morally shaky missions to eliminate the world's rogues by any means possible. 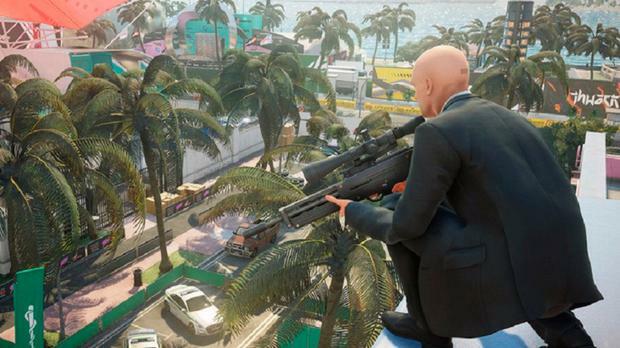 Now shorn of an episodic structure, Hitman 2 settles quickly into a familiar groove. Your bald killer is dropped on the edge of a thronged event (a motor race, say) or opulent estate and you unpick the routines of the security guards and don stolen disguises for progressively closer access to the target. There's no great skill required here except keen observation, in a simulation packed with interconnected parts. Like dismantling an incredibly intricate clock, it takes time to get the lay of the land, discover vulnerabilities and execute the plan. But Hitman 2 conceals so many layers that each assassination lends itself to half-a-dozen often comic variations. Why bother with hands-on strangulation when crushing your quarry by sabotaging a giant suspended shark in an aquarium grants an incrimination-free escape? There's no great innovation here and even the locations cannot outshine the spectacle of those in the 2016 Hitman. Yet there's such a generosity of content, an abundance of incidental detail and a level of polish that makes Hitman 2 irresistibly moreish. In an age where kid-friendly 3D platformers were all the rage, Spyro the Dragon flew high above the crowd. The remake of Crash Bandicoot showed there was an appetite for a revival and this trilogy is content to leave the gameplay alone while tarting up the originals' audio and visuals. On mature reflection, the flaws are obvious - a squirrelly camera, sudden difficulty spikes and a certain repetitiveness. But its irrepressible main character, varied level design and generally approachable gameplay render this Spyro comeback a pleasure for nostalgic fans. Younger players looking for something new might just be captivated, too. The public clearly agrees - the trilogy outsold Red Dead Redemption 2 last week.